Here’s the transcript of an interview with Dan Hennah conducted with TheOneRing.net and a handful of other reporters during a set visit to The Hobbit: The Battle of the Five Armies. Dan Hennah: This is our concept room. Normally, we have all the pictures, all the concept art from all the sets around the walls. In this case, we’ve just got the concept art for the pick-ups. So we’ve cleaned the room out and we re-pictured ourselves. So really, this last ten weeks of shooting, well, it’s only six weeks so far, is pretty much what’s on the wall. Starting off on the left, there was Bree streets, which was a great fun thing to revisit. 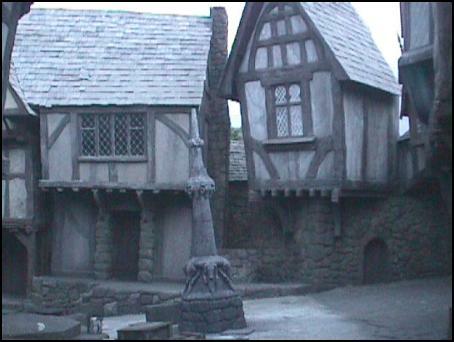 The thing with Bree streets that we never established when we shot it the first time for Lord of the Rings was where Aragorn’s room was, because we shot the exteriors long before we built the interiors. So this time around, with our re-build, we established a window that matches the window that Aragorn was looking through when he saw the Ringwraiths. That’s something for trainspotters to look for. Question: Was that fun, to revisit the streets again? Dan Hennah: It was absolutely fantastic. It really was cool. And we had a few pieces from the old Prancing Pony, Bree’s streets, the sign for the Prancing Pony and there was a sort of cenotaph statue outside. 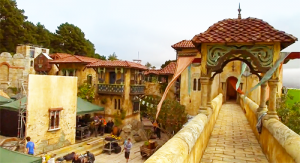 And this time around, we were also able to integrate the Prancing Pony with Bree’s streets as one set, so you could walk off Bree’s streets in through the door of the Prancing Pony, whereas previously, one was inside, one was outside. Question: Where did you build it? Was it out in the back lot? Dan Hennah: In the F stage. Yeah, F stage. Beorn’s house was a great fun build that we did and shot previously. And we’ve just rebuilt elements of it this time for pick-ups, not the whole thing. Question: This is movie two stuff, right? Beorn is the bear. Dan Hennah: (overlaps) Yeah, yeah. Beorn’s now in movie two. Anduin Grasslands was really just an interim piece of location between the Carrocks and Beorn’s– It’s where Bilbo first sees Beorn and comes running down to tell the guys there’s a big monster there. And that was all shot in the stage. A couple of small set pieces. High Fells tomb, this is one of the places Gandalf goes. Every time in the book when he wanders off and leaves them alone, he goes somewhere, and one of the places is the High Fells tomb where he discovers that the Kings of Men have been resurrected. He’s not quite sure what as, at that point, but he finds out later on. Question: Is this a real location? Dan Hennah: (overlaps) That’s a real location that we did a little bit of artwork on to make a chiseled cliff face, and then we built some elements. Question: Where was the location? Dan Hennah: It’s Glen Eyrie Lakes in Central Otago. Dan Hennah: It’s a beautiful place. Just below that, there’s big, black lakes. You can just see the tip of one in that photograph. Yeah. Question: Excuse my ignorance, but how are these artworks made? Dan Hennah: Those are all generated, computer artworks. And Mirkwood Forest Gate was a set we built for the pick-ups with some Elven elements that were quite elegant, but very old and slightly disheveled. And then the trees themselves on the outside of the forest are really just great, big ancient forest trees, but once you go inside the forest, they get really creepy. Well, really psychedelic, in a way. Question: Is that a butterfly? Dan Hennah: Yeah. That’s just about the scale. I was just trying to work it out, what the scale of Mirkwood was. Question: Yeah, that’s a big tree. Dan Hennah: Huge, ancient tree with a canopy above. Question: Was it the same scale, how it worked in the films? Dan Hennah: Pretty much, yeah. Question: Mirkwood seems to have a Dagobah, swampy feel. Question: Is Peter planning a smell-o-vision element to that? Is he going to pump some psychotics into the theater at that point? Dan Hennah: (overlaps) It would be cool, wouldn’t it? That would be very cool. Question: Roger Corman would do it, is all I’m saying. William Castle would be all over that. Dan Hennah: Thranduil’s realm. The thing with Thranduil’s realm is that it’s all inside the mountain, But he’s tried to create, all the elves have tried to create the feeling of a forest, but in a very art nouveau-influenced way. Dan Hennah: No, no, no. He’s not. But for whatever reason, they live under the mountain. So we’ve tried to keep the very Elvish art nouveau influence going in that environment. Question: So are a lot of these concepts Alan and John’s? Question: Yeah. Well, there was–Andy was shooting those, right? Dan Hennah: That’s right, that’s right. Question: They are on the river, too. Dan Hennah: And on the river, yeah. Question: That was interesting, watching dwarves float down. They didn’t get off on the right spot. 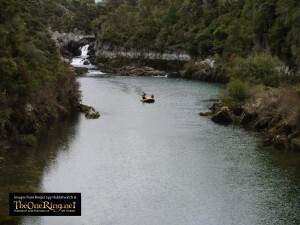 Dan Hennah: Were you at the Pelorus River as well? Yeah, yeah. You realize that the day after, it had risen fifteen meters? Dan Hennah: That would have been cool. These are just continuity shots from Thranduil’s cellars, which we shot in the main shoot, but we’re doing some pick-ups again now. This is the High Fells Grasslands. 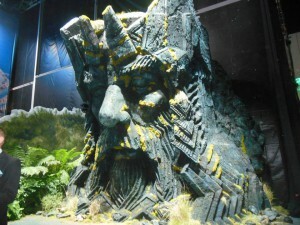 This is just beside the High Fells– Well, it’s just after Gandalf and Radagast have come out of the High Fells tomb and they’re talking, they realize that the Kings of Men have been resurrected as some sort of spirits, and Gandalf goes off to Dol Guldur. And Dol Guldur we see quite a lot of. It’s a very mean, vicious place in the Great Greenwood, which is now Mirkwood Forest. And it’s the main influence, it’s the main dark influence. They have all these vines that have– And toxins and things that have killed off all the trees or are making things rot. And there’s a whole lot of confrontation there between– Well, first Gandalf finds Thror, who’s been held prisoner for years. 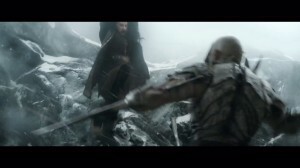 Then he confronts the Ringwraiths, who are the Kings of Men who have been resurrected by Sauron, and then he has a confrontation with Sauron, and some elves come and help him out. It’s all pretty much out of the end of The Return of the King, the appendices. So it’s all from the Tolkien resource. Bard’s house. We go to Lake-town. Of course, Bard picks the dwarves up on the river and takes them to Lake-town. He takes them into Bard’s house. There’s a whole lot of subterfuge going on as they are sneaking around trying to get weapons and trying to get supplies to go to the Lonely Mountain without giving away too much. And the Master of Lake-town, who’s a really great character, is trying to stop them, or trying to get a part of anything that’s going on, basically. Dan Hennah: Yeah. So Lake-town we pretty much treated as a village on a lake that is a few hundred years old, and the bed of the lake is mud and so the village has sunk a little bit here and a little bit there. And so it’s all a bit higgledy-piggledy. And pretty run right down. The tax department have been taking too much money, the people haven’t got anything left. It’s a story that all governments should watch. Question: The Master’s listening in on all the emails and the phone calls. Dan Hennah: (overlaps) Yeah, yeah, all that stuff. Question: He’s got his own prison running. Dan Hennah: Valley of Dale. The whole city of Dale– In the first place, we saw the city of Dale in all its glory in the first picture, in the prologue to the first picture. But when we see it again now, it’s been ruined, it’s been blown by Smaug a hundred and sixty odd years earlier. And so the dwarves who walk through there on their way to the Lonely Mountain find it pretty much as it was. No one’s been there. There’s petrified bodies and all sorts of stuff in the streets. And from Dale they see Erebor, and they of course travel on to Erebor, and they find their way around the back. And we have the big statue of Thrain. I think it’s Thrain. Or Durin? Thrain. Around the back. And they climb up the statue to this little piece at the back and they find the door into the back of the Lonely Mountain. So we built that as a set piece which we just resurrected and just chopped up again. Question: You built the giant head? Dan Hennah: Yeah. The giant head, it’s very cool. And then, of course, they go inside the Lonely Mountain and they find it in a very wrecked state. But there are some rooms that are beautiful that the dragon hasn’t got to and some that the dragon has got to and stored up all the gold. 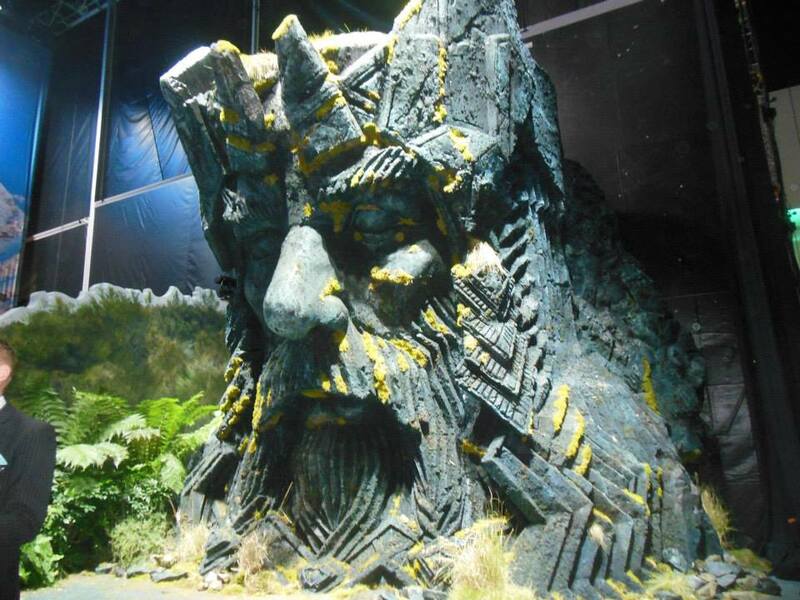 So there’s a whole lot of stuff that happens inside Erebor. Question: That’s what they’re shooting on K, right? Dan Hennah: Yeah, yeah, yeah. Ravenhill Fortress. Question: Almost has an Escher quality to it. Dan Hennah: Yeah, yeah, it really does. That’s a pet John Howe piece. Ravenhill has been a great challenge. It’s taken four years to find out what Ravenhill is. And obviously we always knew that it’s an outpost of the Dwarves, but it was really how Peter wanted to use it in the film and so therefore what we had to build. Dan Hennah: Yeah, which is in the trailer. Without giving too much away. Question: Yeah. “It’s in the trailer.” There is a Smaug in The Desolation of Smaug. Yeah. We were pretty surprised to see it in the trailer, actually. I was. Dan Hennah: Me, too. But interestingly enough, you don’t actually see all that much. You think you’ve seen it, but it’s a shadow and an eye. Question: (overlaps) Yeah, you see just a little there. Dan Hennah: And right now we’re just shooting this Battle of the Five Armies stuff, which are very much film three elements. Question: So, Dan, just to make sure I understand, and to get it on tape, the purpose of all these is to help you guys when you need to build them practically. That’s really what it’s all about. Dan Hennah: It is. There’s a two-fold purpose. First, to establish what Peter’s vision is, which is what concept artwork really does. And then from that, we, in discussion with Peter, work out which part of that he feels he needs, which part he can shoot. And then we go out and we make a model. And the model is usually the elements that we think he needs for his shoot and he think he needs for this shoot. He looks at the model, and invariably we’ve modeled a little bit more than he thinks and it’s going to cost a little more than we’ve got. 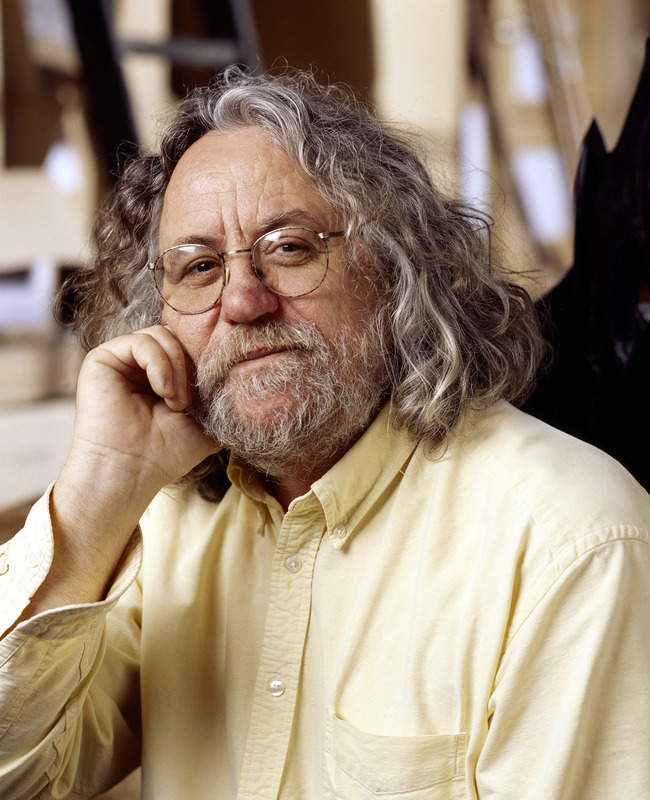 So he can say, “Well, I like this bit and I like this bit,” and then we go into set design. So then there’s a whole set drawn before we start construction. But right next door, we’ve got some models. So if you’re ready, we’ll pop up. This is the garden city of Dale. This is as we built it for the prologue. And in this case, we built the model thinking, “Oh, yeah, we might need to build this piece as a set, or maybe that piece or that piece.” And Peter liked it all so much that we built the whole thing as a set. So that’s up the hill. Have you been up there? Mount Crawford. It’s where we’re shooting on Monday. Question: Yeah. I’ve heard it’s awesome. Dan Hennah: What we did was we build it like this in all its finery in mid-summer, with this little carousel and all the fruit and vegetables. And then we shot that for two days and then we trashed all of the greenery and cut holes in the roofs and burnt windows and so we made it look as post-Smaug. Dan Hennah: Dale is post-Smaug. Yeah. Question: So, this is Dale. This is pre-Smaug. This is happy Dale. Dan Hennah: This is very happy Dale. This is a little pick-up piece we built for the cellar, the wine cellar. Thranduil’s wine cellar.